Routine ditch and culvert cleaning (and maintenance) assures proper water flow, protects structures and lessens the likelihood of flooding. In many cases, special care is taken to prevent erosion and sediment damage, as well as protect aquatic life in streams and rivers. Roadway debris (things like dirt, small rocks, and greasy residues) can interfere with the drainage of storm water, allowing unnecessary pollutants to enter Maryland waters. In addition, debris can become airborne – a potential safety threat for motorists, pedestrians and bicyclists. 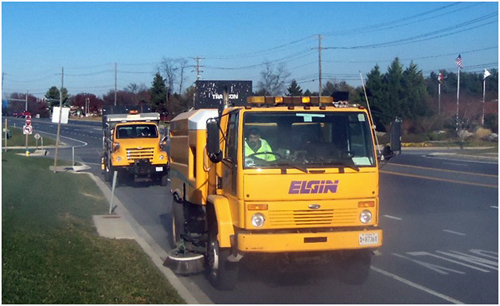 SHA sweeps sections of roadway along curbs to minimize debris.